Between September 21 and 27, 2015, Alpinist contributor Clint Helander posted his photos and stories on our Instagram, Facebook and Twitter pages as part of our Alpinist Community project. Helander has been featured on our website and his words appear in Alpinist 32, The Relentless Raven, Alpinist 46, Local Hero: Mark Westman, and Alpinist 49, The Question: The Direct East Face of Golgotha. Alpinist back issues are available for sale here. Download Alpinist from the iTunes App Store here. Below is a compilation of his work from that week. I strive to fill my photographs with a sense of partnership, unique natural perspectives and inspiration. It's hard to take a bad photograph of Alaska's mountains, but capturing the moments of fear, doubt and trust is what makes it enjoyable. All too often an alpine bivy leaves much to be desired. Jason Stuckey and I felt fortunate to find a protected nook to pitch our tent on the 4,400-foot West Face of Apocalypse Peak in Alaska's Revelation Mountains. 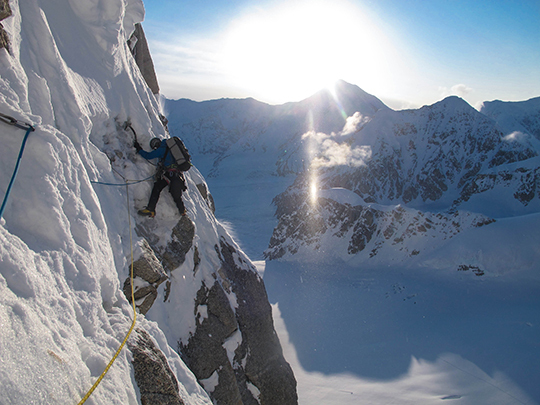 The next day we continued upward through steep, melting ice to complete the first ascent of this forgotten Alaskan behemoth. 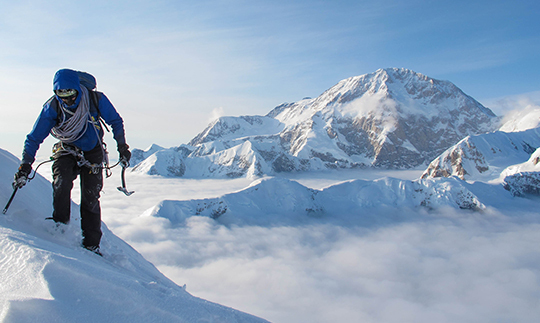 Mist and ice crystals swirled upward between an unnamed, unclimbed mountain and Apocalypse Peak as we neared Apocalypse's summit. From the base of the giant mountain, Jason Stuckey and I had our doubts about success but they evaporated and we climbed to the top. 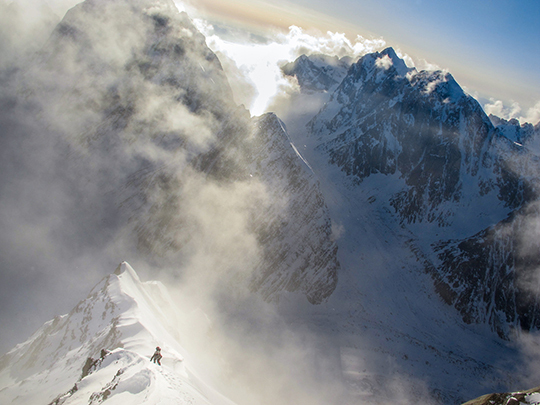 Graham Zimmerman traverses a snow fluting on Mt. Hunter's (14,573') West Ridge (Alaska Grade 4 5.8 AI3, 8,000'). 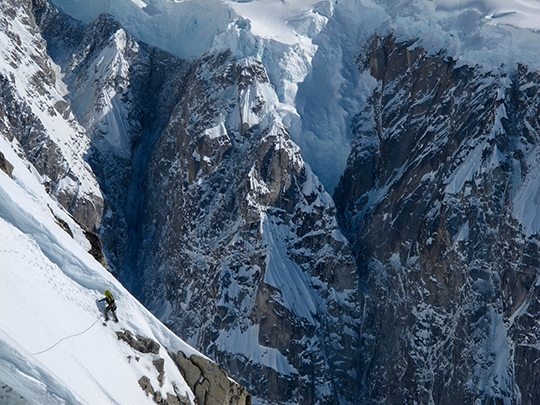 Before I could even lead hard ice, I envisioned climbing terrain like this. To this day, Mt. Mausolus (9,170') in Alaska's Revelation Mountains remains the climb that tested my abilities the most. 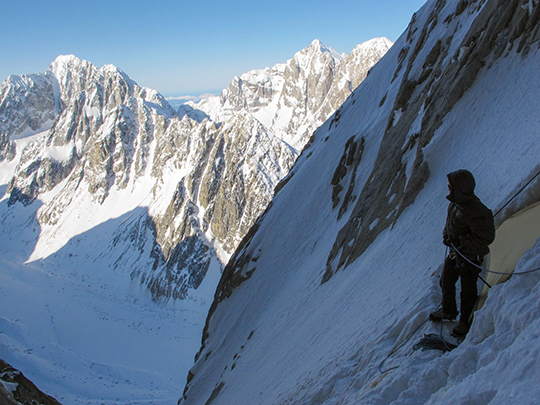 After four years of attempts, Scotty Vincik (seen here) and I finally made the peak's first ascent in March of 2011. When the rocks started falling, Scotty raced to a protected overhang where we shivered out the long, sleepless night. In 2012, I partnered with Southeast Alaska hardman Ryan Johnson. Countless stories of triumph and tragedy quietly played out in my head as we climbed on the Bibler-Klewin, aka the Moonflower Buttress (Alaska Grade 6: 5.8 A2 AI6, 6,100', Stump-Aubrey [to last rock band], 1981; Bibler-Klewin [to summit], 1983), on Mt. Hunter (14,573'). As Ryan led through the upper pitches of the McNerthney Ice Dagger, I questioned how long that death mushroom would cling to the wall and how I had drawn the short straw to belay underneath it. Steve Mascioli was killed on this same route when a similar snow mushroom collapsed above him in 1997. The Bibler-Klewin has a conglomeration of famous pitches: The Prow, the McNerthney Ice Dagger and the aptly named Shaft. 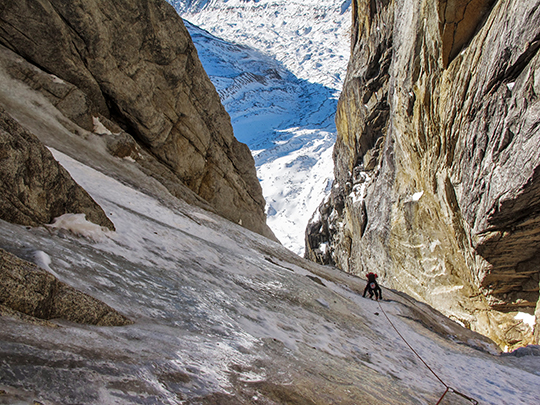 Here, Ryan Johnson leads out on Tamara's Traverse. 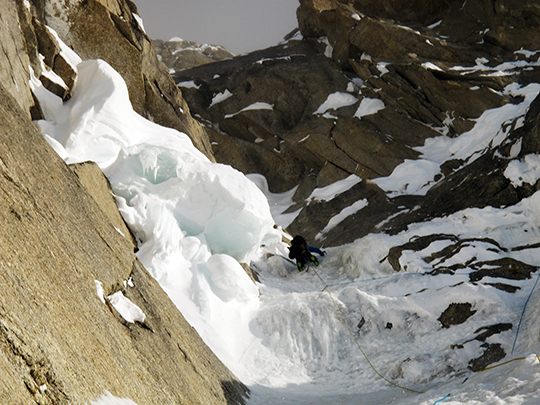 While leading the next pitch, my crampon broke in half and plummeted to the glacier, ending our attempt on the route. For over a decade I had dreamed of climbing the Bibler-Klewin, aka the Moonflower Buttress (Alaska Grade 6: 5.8 A2 AI6, 6,100', Stump-Aubrey [to last rock band], 1981; Bibler-Klewin [to summit], 1983), on Mt. Hunter (14,573'). In 2013, I landed at Kahiltna Base Camp without a partner. Soon I was skiing toward the route with Mark Taylor and Vito Spoldi. As we racked up at the base, I realized I didn't even know their last names. We committed to climbing light and left the sleeping bags behind and surpassed even our own expectations by completing the route to the summit and back in 73 hours. Helander has been featured on our website and his words appear in Alpinist 32, The Relentless Raven, Alpinist 46, Local Hero: Mark Westman, and Alpinist 49, The Question: The Direct East Face of Golgotha. Alpinist back issues are available for sale here. Download Alpinist from the iTunes App Store here.